Missing teeth can lead to a host of problems. They can make you feel self-conscious about your appearance. You may hide your smile in pictures, during laughter, or even while speaking. It can be embarrassing to smile, knowing there’s an unseemly gap in your teeth. Besides lowering your self-esteem, missing teeth can also contribute to weakened jaw support. Your teeth and teeth roots give your jaw added stability and security. Without your teeth, your bite could become misaligned and your jaw could deteriorate. At Echeverri Dental Center, we offer an effective solution for replacing your missing teeth. Dental implants are one of the best ways to restore missing teeth because they act like real teeth. Dental implants consist of an artificial tooth root and a porcelain crown to mimic natural teeth. The artificial tooth root is made of a titanium post that will give your jaw added support, just like a real tooth root would. An abutment connector links the titanium post and the porcelain crown together. The porcelain crown is customized to match your surrounding teeth. We will customize it to blend in seamlessly with your smile. It will also fill the gap left behind by the missing tooth. At Echeverri Dental Center, we place your dental implants at our very own office. You won’t need to visit a surgeon or outside source for your dental implants. Instead, we can do it all in-house. We’ll be right there with you from start to finish. We also restore dental implants at our office. We can place a crown, dentures, or other dental prosthetics on top of your implant to better enhance your smile. Contact our Houston, TX dentist office to learn more about dental implants and how they can help you improve your smile! Call today to schedule your appointment! 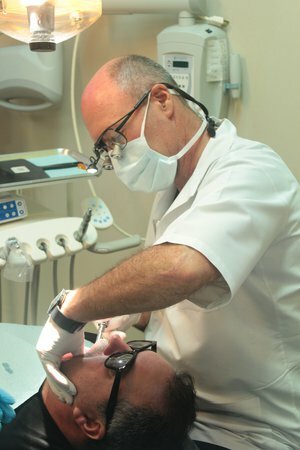 We look forward to helping you restore your smile to excellence!